Only 4 left in stock - Order today! The entire sealed cooling system is covered for 3 full years! With a guarantee like that you can rest assured that your prized collection will remain safe and properly protected for years to come. How many decibels does it emit during operation? BEST ANSWER: I don't have a sound pressure meter, but it makes a lot more noise than you'd hope it would. I've had the service people out to see if they can quiet it down, but they said that's the way it works. They said it is designed as a commercial cooling system, not for home use if you plan to put it in a kitchen. It's very quiet. We keep it in our pantry, which has a door, but when I go in there I hear no noise. I love this cellar. It's beautiful and it holds lots of wine. So glad we bought it! How many regular wine bottles does each rack hold? BEST ANSWER: 10 standard Bordeaux bottles per shelf. Drops to about six per shelf if you have slightly oversized bottles like those frequently used in CA. 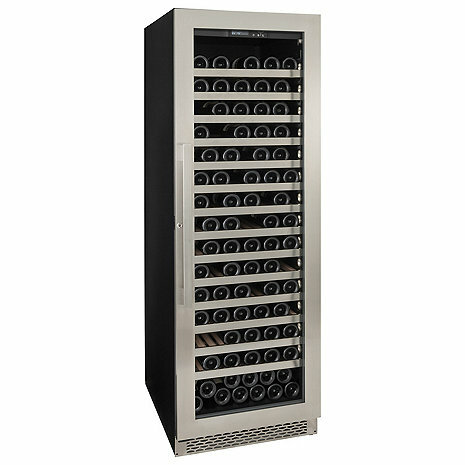 William, in the standard configuration the max bottle capacity is 10 bottles. Will this cellar fit magnums on the bottom? BEST ANSWER: C D, You shouldn't have an issue fitting mags on the bottom o this unit. That being said magnum bottles can vary in size, so you might need to remove the shelf directly above. Thanks! My unit makes a lot of noise -- it is nowhere near "Library Quiet, you'll hardly know it's on" as they advertise. Is anyone else having this problem? Also, my unit puts out a periodic gaseous odor of some kind. Are you getting weird smells from it?